The Wunderkammer of GAM in Turin hosts for the first time in its space the sculpture Spatial concepts by Lucio Fontana, restored to its original bright color after a long restoration. Thirty drawings of the Spatialism master restored after nearly two decades of neglect are exposed to accomplish the exhibition Lucio Fontana. Spatial concepts, until the 30th of August, 2015. The former director of the GAM in Turin Danilo Eccher with the collaboration of the museum conservator Virginia Bertone and the art historian Pietro Luca Nicoletti wished to welcome in the elegant space of the Wunderkammer the artist drawing production donated by his wife Teresita Rasini Fontana in 1970 at the Galleria Civica and afterwards addressed in 2009 at Gabinetto Disegni e Stampe GAM. This shows the strong interest and commitment by the museum management to initiatives aimed at recovering and reviewing the works and related inventory data. The museum is well made public by the exhibition Lucio Fontana. Spatial concepts through the display of the artist drawing production which although often overlooked by the public highlights how Fontana used the paper as a proof onto visualize the items disposal. The ductus is quick and impulsive; the material is attacked in a controlled manner outlining forms and figurative or abstract images: “instant translation of a mental input” as Nicoletti says. The drawing is, therefore, a means to get familiar with signs traced almost obsessively, then translated into a series of gestures on the canvas or in the modeling. L. Fontana, Ambiente spaziale, 1948 (fl/2167). Ink brush on paper. Credits GAM – Fondazione Torino Musei. Not only have the graphic works of Fontana suffered a major restoration campaign and review of inventory data. 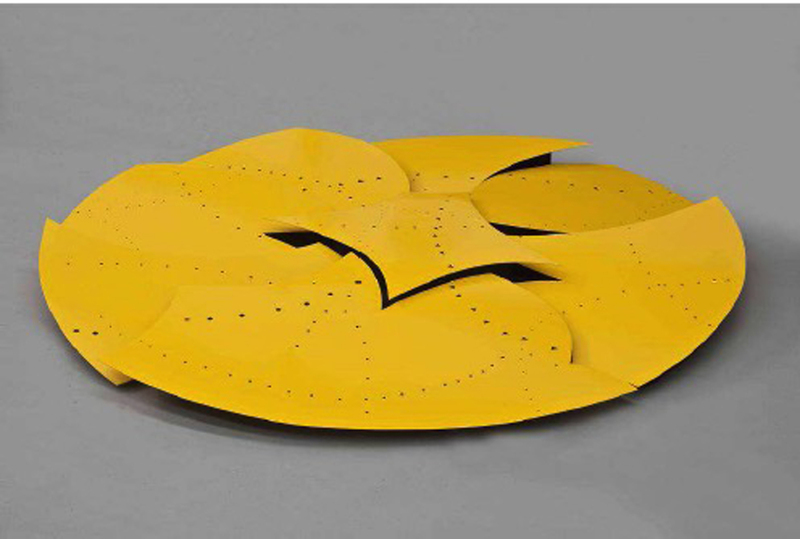 Also the large yellow disc, the floor sculpture entered in the collections of the museum with a direct purchase by the artist in 1965 experienced a similar destiny. 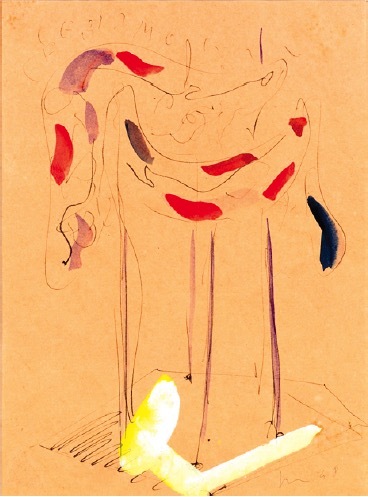 Concept Space (1952) (inv. S / 300) exhibits a rare anti-monumental spirit given both its horizontality and its conceptual prediction to be displayed outdoors, this latter as a pure naturalistic declination of Spatialism. The flower, as mentioned by the artist in his informal correspondence with the museum director at that time Luigi Mallè, for its unfortunate outside location was a victim of the degradation of materials. In fact, already in 1987 it underwent a restoration that brought it back to the public after the reopening of the gallery in 1993. More recently, the intervention began in the fall of 2013 and ended in early 2014 allowing for the enjoyment of the work restored to its original yellow saturated and bright. The restoration never as in this case has raised facts and evidences believed lost, and the exhibition is an opportunity to reflect on the objects and on their material, critical and creative history. Cover image: L. Fontana, Concetto spaziale, 1952 (S/300). Eight elements in painted iron. Credits GAM – Fondazione Torino Musei.